What Is Cervical Spondylotic Myelopathy/ Spinal Cord Compression? Cervical spondylosis is a general condition that occurs as we age that results in the weakening and drying out of the intervertebral discs in the neck. Degenerating discs can later contribute to the development of osteoarthritis of the neck. During the aging process, the body often responds by creating more bone. This bone can take up valuable space and compress or squeeze the spinal canal, often leading to several syndromes including cervical spondylotic myelopathy and cervical radiculopathy. Cervical spondylotic myelopathy results in a loss of function as a result of changes of the discs and facet joints stemming from compression of the spinal cord. 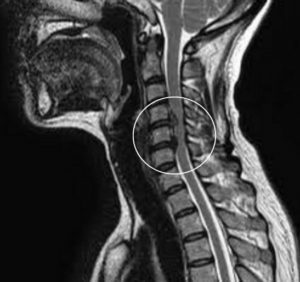 This is an extremely serious condition that may place patients at risk of neurologic deterioration and should be evaluated by a spinal surgeon specializing in the treatment of complex cervical disorders. What Is the Cause of Cervical Spondylotic Myelopathy/Spinal Cord Compression? The primary cause of cervical spondylotic myelopathy and spinal cord compression stems from the natural aging process that leads to arthritis. The result is cervical disc degeneration that can result in bone spurs, enlargement of the facet joints in the spine, degeneration of the cervical discs and/or thickening of the ligaments. Each of these can contribute to the narrowing or compression of the spinal cord. In additional, patients born with a narrow spinal canal (congenital stenosis) may be at increased risk of cervical spondylotic myelopathy. What Are the Symptoms of Cervical Spondylotic Myelopathy/Spinal Cord Compression? What Are the Treatment Options for Cervical Spondylotic Myelopathy/Spinal Cord Compression? In general, patients with signs and symptoms of cervical myelopathy require evaluation by a spine surgeon. In many instances, patients will be considered for surgical intervention to relieve the pressure on the spinal cord.